Global servo drives and motors market was valued at USD 8.96 billion in 2014, growing at a CAGR of 5.6% from 2014 to 2020. Servo motors are defined as an automatic device that utilizes an error-correction routine to correct its motion. Servo drives add the position control to the motor by adding feedback devices such as encoders. The precise position of the motor's rotor can be attained with the help of feedback device, thus, the number of revolutions could be controlled. Servo drives with positioning control are used in machine tools and need servo motors with a higher dynamic response than standard AC motors. Increasing demand for high performance motors, growing vehicle production worldwide and positive outlook of manufacturing industries are the major factors responsible for growth of global servo drives and motors market globally. Increasing demand for control systems, such as robots or computers, and for information technologies to manage different processes and machineries in an automation industry, are among the major factors driving the growth of the servo drives and motors market globally. Servo drives and motors are used in the automation industry where the motor operates at varied speed ranges without getting overheated. Servo drive and motors use error-sensing feedback to rectify the performance of a mechanism and accordingly adjust the position, speed, and torque. These factors increase the quality and flexibility in an automation manufacturing process. The global servo drives and motors market is segmented by region into North America, Europe, Asia-Pacific (APAC) and Rest of the World (RoW). Asia-Pacific led the global servo drives and motors market in 2014 as well as the fastest growing regional market. The region is also expected to maintain its dominance in throughout the forecast period from 2014 to 2020. Asia-Pacific has seen significant growth in servo drives and motors market significant growth in GDP of countries such as India, South Korea, China, Singapore, Taiwan and several others. and rising industrialization in developed countries like Japan and in developing countries like China and India. These are the prime factors that are driving the growth of servo drives and motors market in Asia Pacific region. In addition, stringent electricity consumption policy and government programs for the replacement of out-dated electric motors with energy efficient electric motors are expected to drive the growth for servo drives and motors market in Europe and North America in coming few years. The servo drives and motors market is segmented on the basis of types into servo drives and servo motors. The market has been further segmented based on different types of servo drives such as AC servo drives, DC servo drives and adjustable speed. Servo motors are further segmented into AC servo motors, DC brushless, brushed DC and linear servo motors. Servo motors are holding the maximum market revenue share in 2014 and are expected to remain so during the forecast period from 2014 to 2020. Servo motors are used in various automation fields where the motor functions at a range of speeds without overheating. In addition, serve motors also functions at zero speed and low speed while being able to retain its load in a set position. These factors are driving the demand of servo motors in servo drives and motors market globally. Servo drives and motors market is further segmented by application into automotive, semiconductor and electronics, material handling, food processing, healthcare and others. The global servo drives and motors market is majorly dominated by automotive segment due to increasing demand of motor vehicles in emerging nations such as India, China, Brazil and Russia among others. Automotive is also the fastest growing application segment in servo drives and motors market followed healthcare and semiconductor and electronics. Servo motors are high performance electric motors having characteristics such as controlling the movement of machines. In addition, servo motors offer easy installation and no maintenance cost. Increasing electricity prices and stringent electricity utilization standards are driving the demand for energy efficient motors globally. 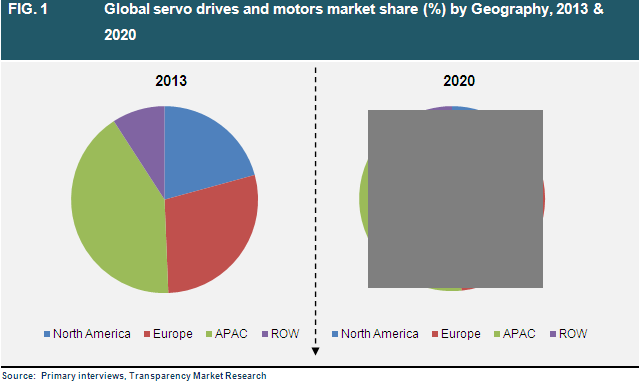 The market of servo drives and motors is expected to grow at a slower pace in North America and Europe region. The demand for servo drives and motors is expected to rise due to the replacement of out-dated low efficient electric motors with highly efficient servo drives and motors. In addition, the strict energy consumption regulations and environment protection acts as the key factors that are driving the servo drives and motors market globally. The growth of servo drives and motors market is primarily attributed to positive economic outlook and growing manufacturing industries in India, China, South Korea, Indonesia, Japan and several other countries in Asia-Pacific region. The increasing demand for energy efficient motors causes the shift from standard energy efficient electric motors to premium energy efficiency motors. This shift in trend is directly contributing to revenue growth of servo drives and motors manufacturers. This market research study analyzes the servo drives and motors market on a global level, and provides estimates in terms of revenue (USD billion) from 2014 to 2020. The report identifies the drivers and restraints affecting the market and analyzes their impact over the forecast period. In addition, it identifies the significant opportunities for market growth in the coming years. The report segments the market on the basis of geography as North America, Europe, Asia Pacific (APAC), and Rest of the World (RoW), and these have been estimated in terms of revenue (USD billion). Moreover, the report segments the market based on types as servo drives and servo motors. The market has been further segmented based on different types of servo drives such as AC servo drives, DC servo drives and adjustable speed. Servo motors are further segmented into AC servo motors, DC brushless, brushed DC and linear servo motors. Furthermore, the market is segmented on the basis of application which includes automotive, semiconductor and electronics, material handling, food processing, healthcare and others. Among all the application segments, automotive segment holds the largest market share at present in the servo drives and motors market. All these segments have also been estimated on the basis of geography in terms of revenue (USD billion). Asia Pacific represents the largest market for servo drives and motors. In 2014, Asia Pacific accounted for more than 40% revenue share in the global servo drives and motors market. The region is expected to be the fastest growing region due to significant growth in GDP of countries such as India, South Korea, China, Singapore, Taiwan and several others. In addition, positive growth prospects in GDP of these countries will help the region to remain market leader in servo drives and motors in coming few years. For better understanding of servo drives and motors market, we have given a detailed analysis of the supply chain. In addition, a detailed Porter’s five forces analysis has been given for a better understanding of the intensity of the competition present in the market. Furthermore, the study comprises a market attractiveness analysis, where the applications are benchmarked based on their market scope, growth rate and general attractiveness. The report provides company market share analysis of the various industry participants. Key players have also been profiled on the basis of company overview, financial overview, business strategies and recent developments in the field of servo drives and motors. Major market participants profiled in this report include Siemens AG, Baldor Electric Company, Yaskawa Electric Corporation, Mitsubishi Electric Corporation, Rockwell Automation Inc., Schneider Electric S.E, Emerson Electric Co., Parker Hannifin Corporation, Nidec Corporation and ABB Ltd. among others.